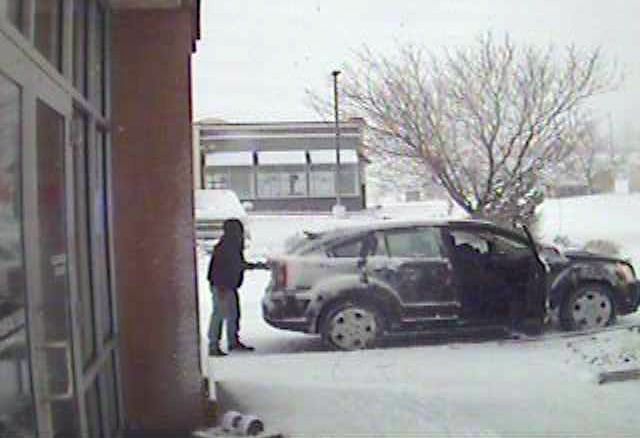 This still from surveillance video was provided by the Elko Police Department. 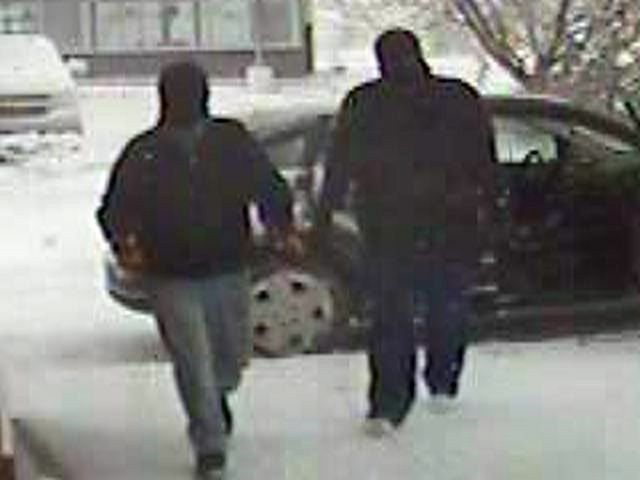 This still from surveillance video was provided by the Elko Police Department. More photos are posted at elkodaily.com. ELKO – Police are following up on leads in Friday’s robbery at Dotty’s Casino, and have released surveillance photos of the two masked robbers. The Dotty’s in the Smith’s shopping center on Mountain City Highway was robbed at about 6:50 a.m. Friday when employees and patrons were sprayed with what might have been bear spray. They fled the casino in a vehicle, and a few minutes later police and firefighters were called to Dotta Drive on a report of a car fire. The robbers are believed to have set fire to the vehicle to conceal evidence, possibly fleeing from there in another vehicle. The vehicle was destroyed by the fire. Palhegyi said police identified the owner and are investigating whether they might have been involved. Anyone with information related to the crime is asked to contact the Elko Police Department at 777-7310. It was the fifth local robbery or attempted robbery in the past five months. An Elko man allegedly robbed a customer at knifepoint at a gas station convenience store on Feb. 13. Timothy Longhurst, 26, was arrested that night following a high-speed chase. He was booked on $246,085 bail. On Jan. 15, a scruffy-bearded man in a sweatshirt attempted to rob a Subway at knifepoint. Police said the man entered the restaurant on Thomas Gallagher Way near the airport, pulled out a large knife and demanded money. The employees fled out the back door and called 9-1-1, and the unidentified man left. On Dec. 8, a man pointed a knife at a cashier at the Sinclair gas station at 1790 Idaho St. and fled with an undisclosed amount of cash. The robber was wearing a white cloth over his face. And on Oct. 3, two people entered the Port of Subs in the Elko Junction Shopping Center, robbing the store at gunpoint. One of the suspects was identified at Erika M. Lozano, She was arrested in December and her bail was set at $152,500. ELKO – Elko police have made a second arrest in Friday’s casino robbery and car fire, but the investigation of more suspects is continuing. ELKO — Elko police have made a second arrest in Friday’s casino robbery and car fire, but the investigation of more suspects is continuing.